#203: Electoral College End Run | mark Joseph "young"
This is mark Joseph “young” blog entry #203, on the subject of Electoral College End Run. A bad idea which we mentioned in passing some years ago is apparently gaining ground, thanks in large part to Hillary Clinton’s failed 2016 Presidential bid. The idea, which we mentioned in Why We Have an Electoral College (in the page Coalition Government), is to nullify the original Constitutional intent, that the President be selected by the States as States, by having states pass a law assigning their electors to vote for whichever candidate wins the majority of the national popular vote. Even some Democrats recognize that the current popularity of this idea is because the losing party are sore losers, and the fact that Hillary Clinton has added her voice to the chorus only underscores that sense–but as the map provided by the idea’s promoters shows, in green, eleven states have already passed the necessary legislation. That legislation is designed to prevent states from being obligated until there is what they consider a consensus, that is, the legislation passed by each state specifically states that it becomes effective when, and only when, similar legislation is passed by states representing enough Electoral College votes to constitute a majority of the College, 270 votes, that is, one half of the 538 electors plus one. At that point, whoever receives the majority of the national popular vote would, by dint of this legislation, receive at least two-hundred seventy votes and win the election. There is a flaw in the reasoning. Let us suppose that the total is not reached by 2020, and thus it does not impact the 2020 election; but it might be reached in 2021. However, 2020 is a census year, and the primary reason the Constitution mandates that we have a census every ten years is to adjust the representation of each State in the House of Representatives. Following the 2010 census New Jersey lost a seat, and there is every likelihood that some States will lose and others gain seats before 2024. That matters because the number of electoral votes each state gets is determined by the sum of its Representatives plus its Senators, and it might well be that in 2021 the states having passed the law provide sufficient votes to cause it to be enacted, but by 2024 there would not be quite as many. This might be unlikely, but it is not impossible–New Jersey, which has passed the law and has been shrinking proportionately, might lose another seat, and Texas and Florida, which have showed no interest in passing the law, have been growing and might gain another seat or two each. However, that is not really the significant point here. Some years ago a young liberal actress got in serious public relations trouble when she suggested carpet bombing all the conservative states in the central United States because they were impeding the progress that the liberals dominating the coastal states were pushing. That is an extreme example, but the fact is that several of the big states are coastal states, and tend to be liberal–California, New York, Pennsylvania. That means on some level we’re talking about the big states trying to take over. California is an important example. It tends to be liberal, but is short-changed in the Electoral College because it is short-changed in the House of Representatives: there is a cap on the number of Representatives any state can have, and California’s population would give it quite a few more seats were it not for the cap. Let’s face it, though: California is a large piece of real estate with several very large population centers within it. It could plausibly dictate law and policy for the entire country just by flexing its popular vote. That, though, is exactly why the Constitution is designed the way it is. When the big kids tell the little kids what to do, we call it bullying, and we look for ways to punish and control it. The Electoral College is designed to try to keep the big states from bullying the little states. 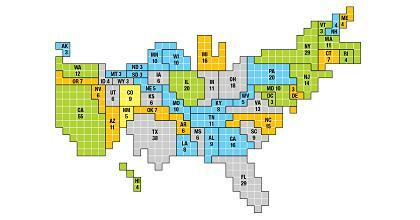 The proposed law disenfranchises the little states. In doing so it disenfranchises the voters in those states. There is good reason for the states to vote for the President chosen by the majority of their own citizens, and not the majority of the citizens of every other State in the Union. We would ask our New Jersey legislators, and those of the ten other states which have already passed such legislation, to repeal it. It is bad law. It is also, as one author already cited has observed, probably unconstitutional–it is an effort to end run the Constitutionally-mandated process. If not, voters in New Jersey and elsewhere should prepare to file suit against the legislature. The law disenfranchises the voters of this state, taking from us our constitutional right to choose the candidate of our own choice, not that of the rest of the country. After the fact, it occurs to me that it also disenfranchises voters in states that do not pass the law, because it potentially diverts support that legally ought to have gone to one candidate and gives it to another. Your discussion of how the number of Electors are apportioned based on the number of House seats is not entirely accurate. The total number of seats in the *House* is limited to 435. The number of seats that a given state gets is only constrained by the requirement that they get at least 1. So for, say California, to have a significantly larger number of seats in comparison to other states they would have to have a corresponding larger proportion of the total population. But there is no limit on that number, other than it has to be proportionate to the population of the country and other states as a whole. Interestingly, this favors small states. Consider this: For some inexplicable reason 95% of the population of the US moved to California. Each of the remaining states would have a very small fraction of the remaining population, but each state would be entitled to 1 House seat. That’s 49 of 453 seats, which is a bit more than 10% when they represent 5% of the population. Weird. I read something somewhere that apparently was incorrect, and now I can’t find it.. However, the point remains that because smaller states are guaranteed at least one representative and all states get two Senators, the value of a vote in Wyoming (least populous state) is greater than the value of a vote in California (most populous state). I understand the idea that little states, – or little kids, as you name them – should be represented by at least one member. Or they will likely secede, feeling ill-represented. However, when we think of “electoral minorities not being represented”, I feel that the bigger flaw of the system (bigger than having the loser of the popular vote being elected) is the “winner takes all” system when all the state electoral college goes to the leading candidate. Consequently, in balanced states, nearly half (the losing half) of the votes are just ignored. Sorry to take so long replying here; my computer was down for a few days, and I’m just getting back to everything. I agree that I would prefer to have New Jersey split its votes proportionally. However, for reasons I mentioned previously, it’s not going to happen. In short, urbanization is increasing here, and the conventional wisdom says that urban areas are increasingly Democratic (in contrast to Republican). The Democrats control the state legislature presently, and have done for some time. They have every reason to believe that they can carry the state in future Presidential runs, and so have a strong motivation against changing the rules to proportional. That motivation is going to be found in all states in which one party tends to dominate. Meanwhile, in swing states there is a strong economic incentive for the winner-take-all rule: during Presidential elections, the national parties and candidates and the Political Action Committees (PACs) pour huge sums of money into advertising in those states, a healthy boost to the local economy which vanishes as soon as you remove that rule and a few votes one way or the other might not even mean another single electoral vote. So while I think proportional voting is the better way, I don’t think we’ll see it. Pingback: #229: A Challenge to Winner-Take-All in the Electoral College | mark Joseph "young"